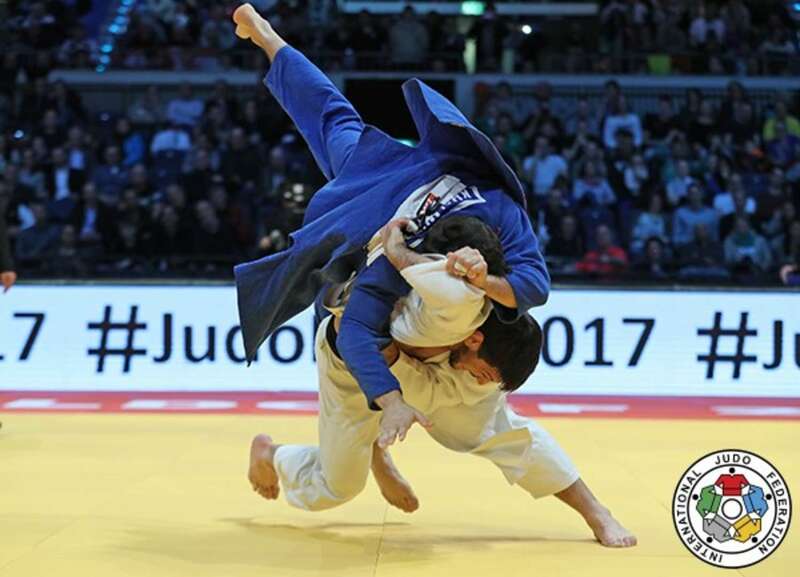 The Dusseldorf Grand Prix 2017 cast Germany as the centre of the judo world one final time on Sunday as the Mitsubishi Electric Halle was transformed into the land of the giants for some colossal ippons which contributed to some first-class judo. The first Grand Prix of 2017 featured five categories on the final day as the men’s -90kg, -100kg and +100kg categories were joined in action by the women’s -78kg and +78kg categories. During the preliminaries there was a special moment in the -90kg category that produced an all-father and son contest. Qingdao Grand Prix winner Max STEWART (GBR) had his father and Seoul 1988 Olympic bronze medallist Dennis STEWART coaching him while his opponent David TEKIC (GER) had his father and former German international Slavko TEKIC giving him instructions from the coaching chair. Mr. Florin Daniel LASCAU, IJF Sports Director, said: “This moment shows that judo is continued through families and generations and in this case it as at the elite level. It is pleasing to see both Max and David follow their family’s judo path and they are two very exciting you judoka. After France and Germany, the IJF World Judo Tour will now head for Azerbaijan and the 2018 World Championships host city of Baku. The second Grand Slam of 2017 will be held in Baku from Friday 10 – Saturday 12 March. World champion UMEKI Mami (JPN) won her first international gold medal since claiming world gold in 2015 as her red backpatch reserved only for world winners finally looks fitting for the young judoka. 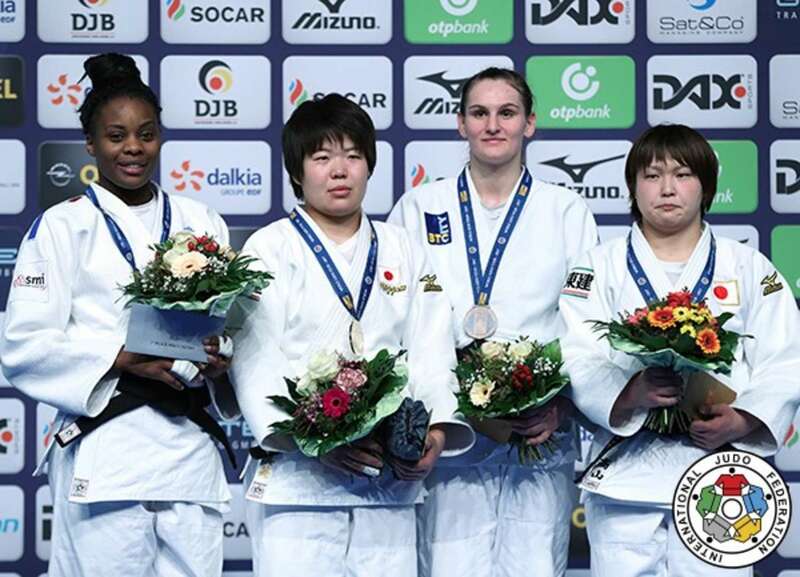 Former Baku Grand Slam winner Madeleine MALONGA (FRA), a two-time Grand Prix winner, was unable to capture a third title despite leading with a waza-ari from an uchi-mata. UMEKI, 22, defeated MALONGA, 23, on the ground as she held down the Frenchwoman with a yoko-shiho-gatame hold to win her first Grand Prix gold medal. In the first semi-final world number five Natalie POWELL (GBR) was beaten by UMEKI. Welsh judoka POWELL attacked with ouchi-gari but was countered by the Japanese for a waza-ari score and then the former was trapped in osaekomi and elected to tap out after three seconds. In the second semi-final Budapest Grand Prix bronze medallist Karen STEVENSON (NED) fell to MALONGA who used her long frame to take down her Dutch opponent with an ouchi-gari for ippon. The first bronze medal was won by Tyumen Grand Slam silver medallist Klara APOTEKAR (SLO) who defeated STEVENSON secure a spot on a Grand Prix medal podium for the first time. A waza-ari for the former was the difference after four minutes as STEVENSON is still finding her feet at this level and will be relatively content with a fifth-place finish. The second bronze medal contest was won by Tokyo Grand Slam bronze medallist TAKAYAMA Rika (JPN) who toppled. Walsall-based Olympian POWELL was thrown for a waza-ari score and the Japanese judoka moved into the osaekomi while also applying the ude-garami and the Commonwealth Games winner was powerless to escape on the ground. 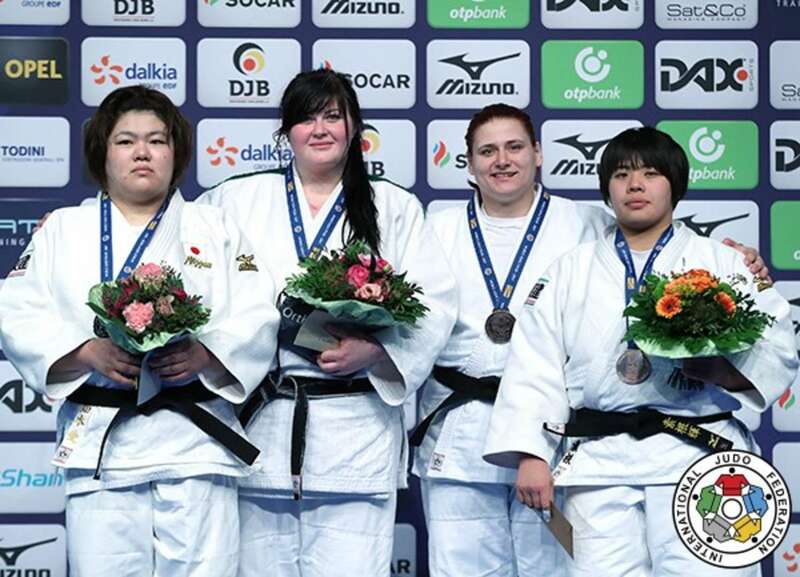 Budapest Grand Prix bronze medallist Iryna KINDZERSKA (UKR) defeated five-time world medallist TACHIMOTO Megumi (JPN) to make sure that her country’s only medal in Germany was of the golden variety. World number 24 TACHIMOTO, 28, was making her return from a lengthy injury lay-off and that showed as the 25-year-old Ukrainian, who was fifth at the London 2012 Olympics, drove over the accomplished Japanese heavyweight in golden score with a tani-otoshi for a match-winning waza-ari score and her first Grand Prix gold prize. In the first semi-final TACHIMOTO defeated Pan American Championships bronze medallist Rochele NUNES (BRA) by a waza-ari score to guarantee one more medal for Japan whose women’s team were on fire in Germany all weekend. In the second semi-final KINDZERSKA held down Madrid European Open silver medallist Kristin BUESSOW (GER) for 20 seconds and ippon in the closing stages of their contest. The first bronze medal was won by World Judo Masters bronze medallist Larisa CERIC (BIH) as her home opponent BUESSOW received a third shido for passivity and was disqualified. The second bronze medal was won by 16-year-old Tokyo Grand Slam silver medallist SONE Akira (JPN) who, having had a morote-seoi-nage countered for a waza-ari score, was powerful for her vastly more experienced opponent. SONE scored three waza-ari to take command of the contest and held down NUNES for 20 seconds to make a mockery of her level of inexperience and the 11-year age gap between the two. Former World Judo Masters winner Beka GVINIASHVILI (GEO) may only be 21 years old but he is one of the most decorated and talented judoka in the sport and is just getting started. The Georgian won his fifth Grand Prix gold medal on Sunday with a mercurial display that illustrated why he is the golden boy of Georgian judo. 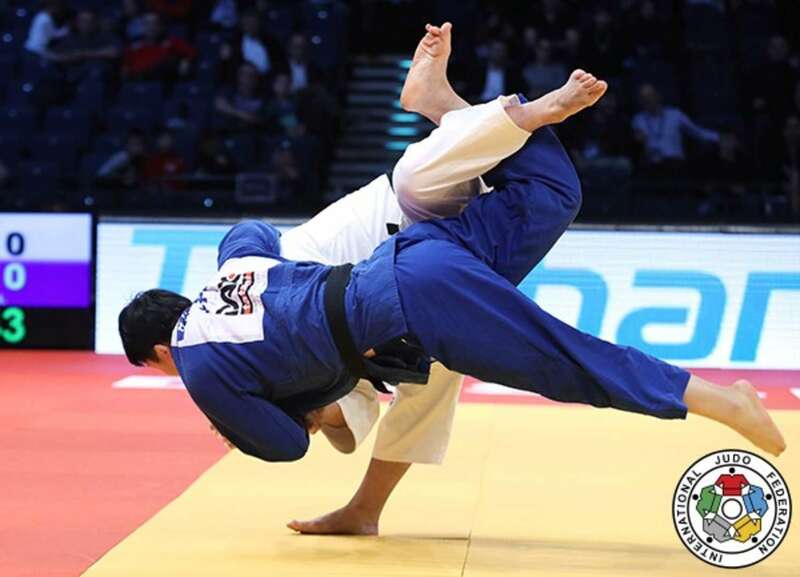 World Judo Masters runner-up Khusen KHALMURZAEV (RUS), who himself is 23 years old, absorbed the power and tenacity of his foe until the last 10 seconds when the Rio 2016 Olympian had plenty in reserve and threw with a huge makikomi effort for a waza-ari before seizing the osaekomi in the form of a kuzure-ushiro-kesa-gatame for gold. In the first semi-final 19-year-old Eduard TRIPPEL (GER), who defeated Tokyo Grand Slam silver medallist NISHIYAMA Daiki (JPN) in the quarter-finals in golden score, came undone against former World Judo Masters winner Beka GVINIASHVILI (GEO). A flashy piece of ashi-waza from the Georgian was worthy of a waza-ari score and former Cadet European Championships bronze medallist gave everything but could find a way onto the scoreboard. In the second semi-final Tbilisi Grand Prix bronze medallist Nikoloz SHERAZADISHVILI (ESP) succumbed to World Judo Masters runner-up Khusen KHALMURZAEV (RUS) by ippon as the Spaniard slipped into the repechage and the Russian moved into the final. The first bronze medal was awarded to world number 20 NISHIYAMA Daiki (JPN) who telegraphed a ko-soto attack from world number 31 SHERAZADISHVILI and countered for a waza-ari before pinning the latter in osaekomi for ippon. 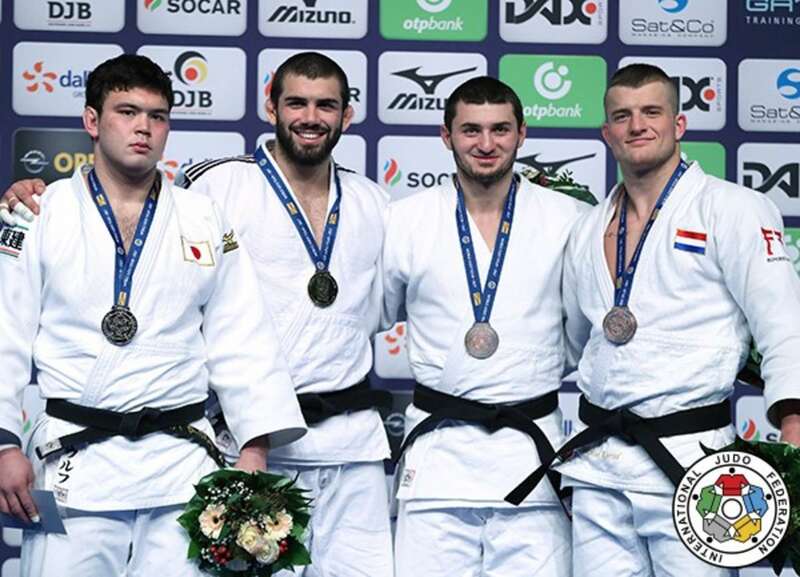 The second bronze medal went to Paris Grand Slam bronze medallist Mihael ZGANK (SLO) as TRIPPEL was denied a home medal after a breakthrough performance. 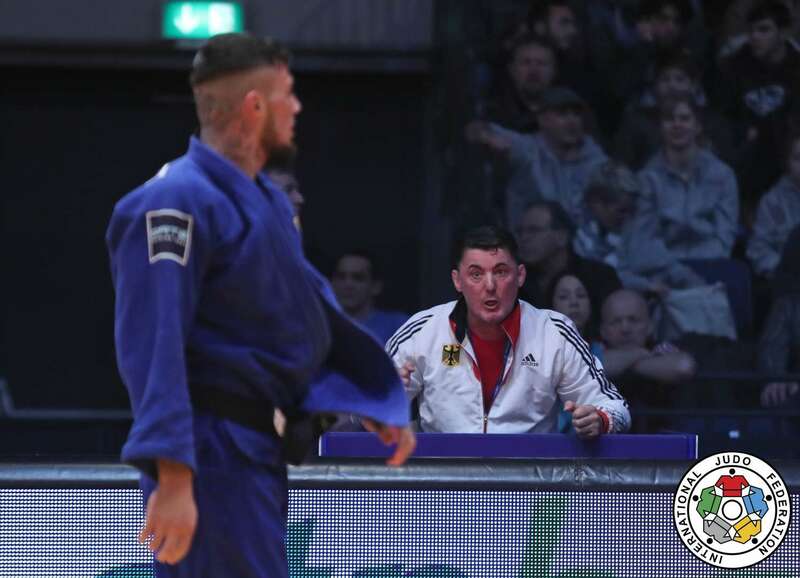 TRIPPEL, who was fighting to become the first German man to medal this weekend, took the lead with a waza-ari from an osoto-makikomi before ZGANK restored level terms with 30 seconds remaining from a koshi-guruma. ZGANK was not done there as he the the young German with a sumi-gaeshi for a second waza-ari with eight seconds left on the clock. World bronze medallist Toma NIKIFOROV (BEL) lost his opening contest in Paris a fortnight ago but bounced back like a true champion to register his second Grand Prix career victory on Sunday. 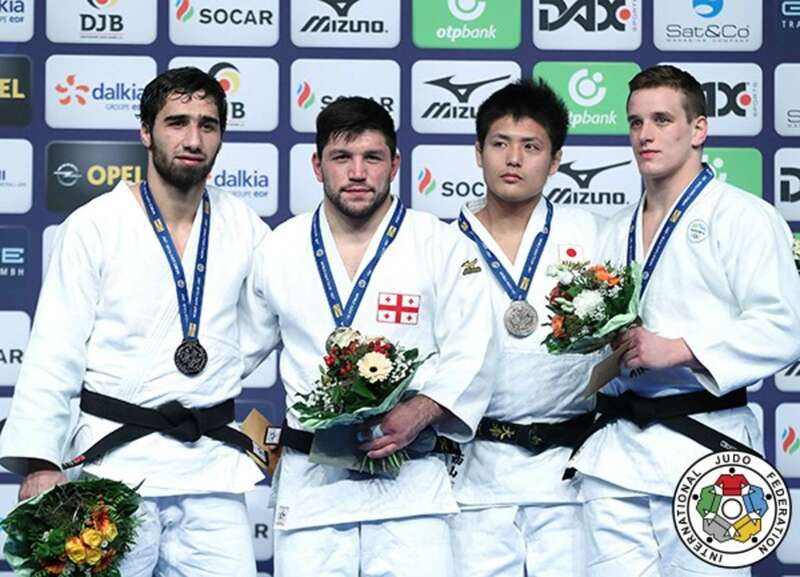 The Belgian fighter, whose last international medal was silver at the European Championships almost a year ago, needed just 35 seconds to defeat two-time Grand Slam bronze medallist and Tokai University member WOLF Aaron (JPN) who had no choice but to tap out to the shime-waza. In the first semi-final former Ulaanbaatar Grand Prix bronze medallist Ben FLETCHER (GBR) matched WOLF in regulation time before being launched with an uchi-mata for ippon after two minutes of golden score. In the second semi-final Tyumen Grand Slam bronze medallist Kazbek ZANKISHIEV (RUS) was below-par against world bronze medallist Toma NIKIFOROV (BEL) as the Russian was penalised three times to receive hansoku-make and send his Belgian adversary into the gold medal contest. The first bronze medal was won by ZANKISHIEV who returned to winning ways against Johannes FREY (GER), the younger brother of two-time world medallist Karl-Richard FREY (GER). The Russian pressed from the outset and scored a waza-ari without reply which boosted his country’s medal count on the last day in Germany. 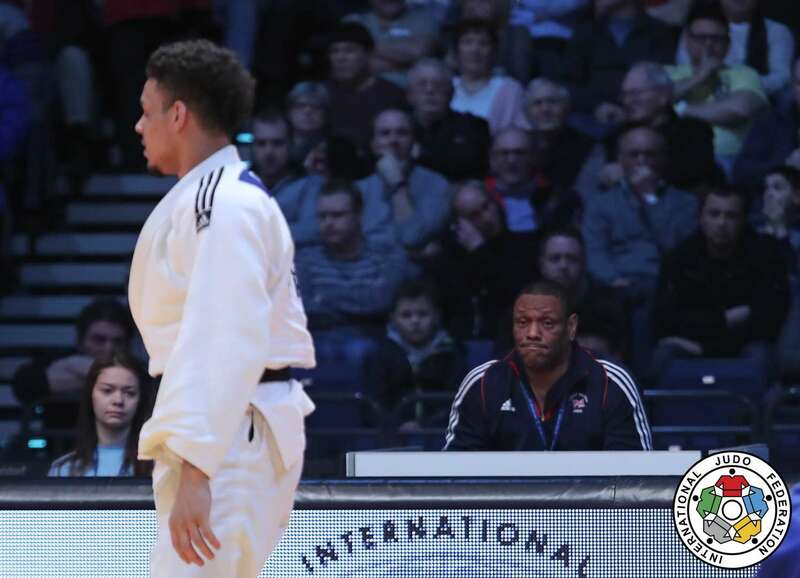 The second bronze medal was won by European bronze medallist Michael KORREL (NED) who held down FLETCHER for 20 seconds and ippon. The Dutch judoka won his fourth Grand Prix medal by pinning down Pinewood Judo Club product FLETCHER who was coached by England-based Juergen KLINGER who comes from Hannover, Germany. Tokyo Grand Slam silver medallist KAGEURA Kokoro (JPN) won the final contest of the first Grand Prix of the year as he unexpectedly defeat Rio 2016 Olympic silver medallist HARASAWA Hisayoshi (JPN). KAGEURA, 21, of Tokai University, is still relatively unknown on the IJF circuit but introduced himself to a new audience in his first senior competition outside of Asia. The 21-year-old, who is now right in the mix for Japan along with Paris Grand Slam winner and fellow Tokai University member OJITANI Takeshi (JPN), countered a weak uchi-mata attempt from HARASAWA for a waza-ari which proved decisive. In the first semi-final -100kg Olympic champion Lukas KRPALEK (CZE) was scored on for the first time today and it was ippon as 21-year-old Tokyo Grand Slam silver medallist KAGEURA Kokoro (JPN) conjured up a highlight reel moment in golden score. KRPALEK moved forward and almost caught his Japanese opponent with a ko-uchi-gari but neither judoka could produce a score in regulation time. After 12 seconds of golden score KAGEURA got under his Czech opponent to throw with a drop-seoi-nage and a place in the gold medal contest. In the second semi-final HARASAWA bided his time before forcing Asian Championships bronze medallist Iurii KRAKOVETSKII (KGZ) over with an ouchi-gari for ippon in the final 30 seconds. The first bronze medal went to Baku Grand Slam bronze medallist BOR Barna (HUN) after an epic duel against KRAKOVETSKII. With no scores after four minutes the medal contest continued into golden score for another four minutes before the Hungarian threw with an ippon-seoi-nage for a waza-ari score. The crowd was eight behind both judoka and stayed with them throughout golden score as they received a pleasing score to finish a memorable bout. 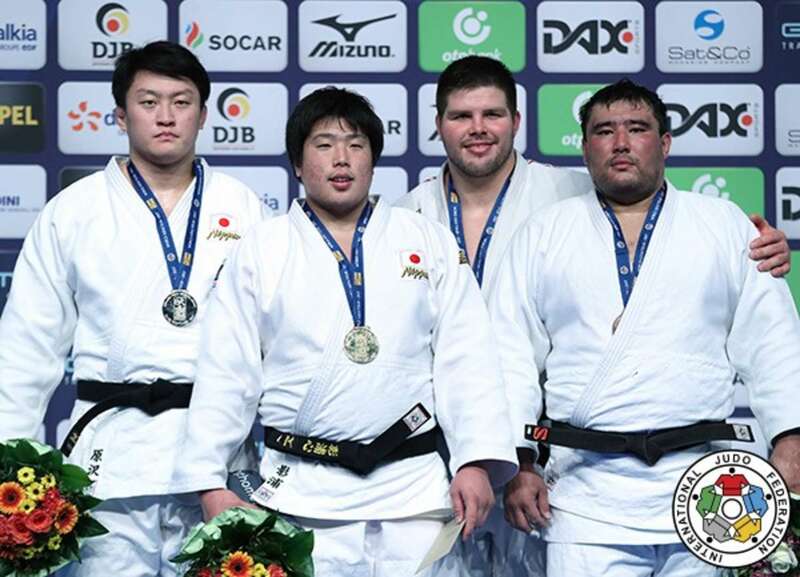 The second bronze medal went to Tashkent Grand Prix winner Yerzhan SHYNKEYEV (KAZ) as KRPALEK endured a frustrating start to life at +100kg on the IJF World Judo Tour. The Czech star looked flatfooted in the early stages and was thrown for a waza-ari with an uchi-mata. KRPALEK, who was on a roll in the preliminaries as he won his first three contests on the ground – including a notable dismissal of 180kg World Judo Masters winner Daniel NATEA (ROU) – saw the contest get away from him as SHYNKEYEV did just not enough to hold onto his avtange and not to receive a third shido.